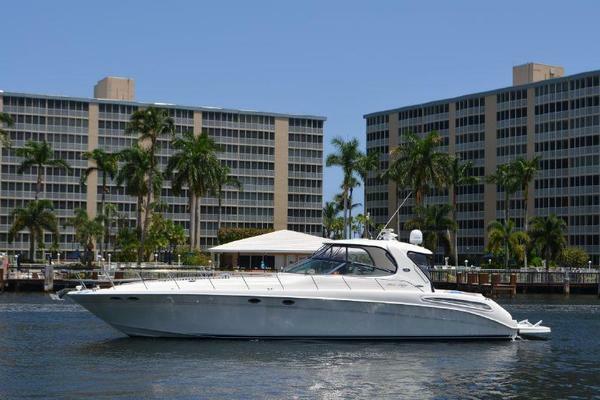 This is the perfect boat for the live aboard couple or for cruising to the Keys and Bahamas. 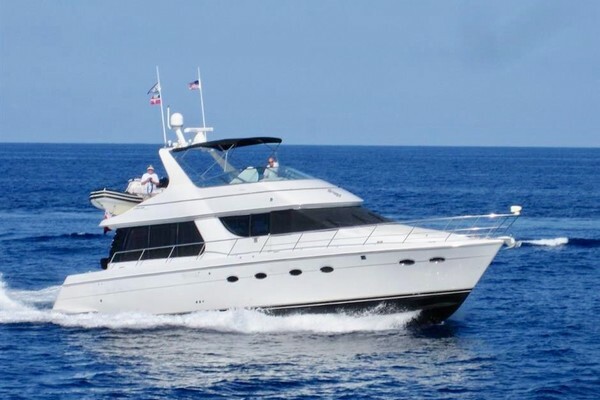 The 445 Carver has a large integral swim platform with storage and molded stairs to the aft sun deck. The sun deck is fully enclosed and well protected from the weather with a hard top and acrylic wing doors. This area also features a wet bar with a newer ice-maker and fridge. Moving forward the sides and foredeck have welded stainless steel rails with boarding gates on either side. There is a sun pad and opening hatch on the fore deck. The fly bridge is up three steps and features a walk around center console helm with excellent visibility all around. There is a comfortable helm seat with arm rests and bench seating both in front and behind the helm console. There is a translucent hard top with a full enclosure. You enter the comfortable salon through a pair of aluminum framed doors and down a few steps. This area has a very open and spacious feel with a lot of natural light and plush amenities. On the starboard side is an L-shaped sofa with Ultra-Leather upholstery and a sleeper. There is upgraded carpeting and two comfortable chairs. The teak cabinets along the port side house the electrical panel, central vacuum and entertainment center. Moving forward and down a few steps is the well appointed galley to starboard and the U-shaped dinette that also converts to a double berth. The galley has a full sized fridge with ice maker, 3-burner stove w/oven, microwave oven, new coffee maker and Corian counters. Forward there is a stacked washer/dryer and guest stateroom. The guest head has a separate shower and dual access from the stateroom and hallway. The full beam Master Stateroom is aft and has a queen island berth and lots of hanging and drawer storage. There is a lighted vanity on the port side and the head is to starboard with a separate shower. The interior features hand rubbed teak paneling and cabinets with a tremendous amount of hidden storage throughout the vessel. Aft deck wet bat with ice maker and fridge. The bottom was stripped and an epoxy barrier coat applied in 2014. The bottom was freshly painted and the props balanced in April 2017. The owner is a retired airline pilot the ensures that all of the maintenance is always updated on the proper schedule. This boat is truly turn key and ready to go cruising tomorrow.